Now that sanctions are gone, Iran is seriously flexing its oil muscles in hopes of luring back Western energy companies. Iran pumped 3.64 million barrels per day in May, just four months after sanctions were lifted, according to the International Energy Agency. That's the fastest pace since June 2011, before tougher sanctions were imposed by the U.S. and other world powers over Iran's nuclear program. 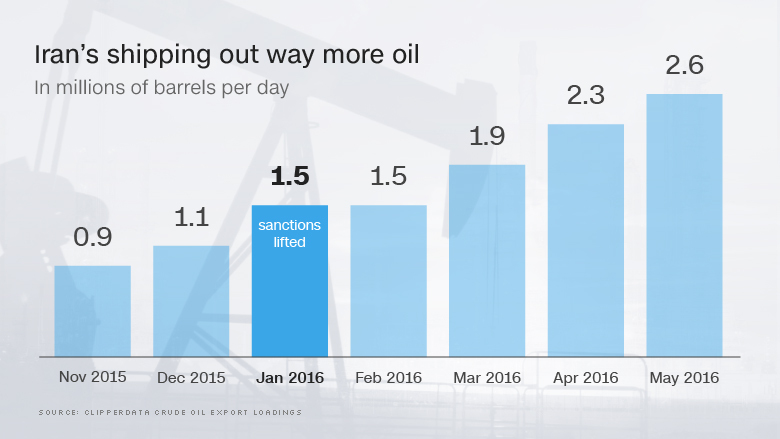 All told, Iran's oil production has surged by 730,000 barrels per day since the end of 2015, the largest gain from any OPEC country. It fits in with OPEC's recent efforts steal back market share by flooding the world with lots of oil. More importantly for Iran's sanctions-rattled economy, the country is also shipping tons more crude overseas. Iran's waterborne crude exports surged to 2.6 million barrels per day in May, nearly tripling the pace from November 2015, according to research firm ClipperData. The export strength has been fueled by higher production and drawing down onshore stockpiles. "Iran has been very successful at ramping up crude production since sanctions have lifted," said Julius Walker, senior consultant at research firm JBC Energy. "It remains difficult to say whether they will be able to maintain or grow these levels further." Iran's comeback creates an interesting dynamic for the shifting supply-demand situation in the oil world. On the one hand, the influx of Iranian crude has helped offset large and unexpected production outages in Nigeria and Canada. At the same time, the already-crowded supply picture is likely to look a lot more congested once those countries get back on track and with Iran's output resurgent. No matter where it's going, Iran's soaring oil exports give the country the financial flexibility to step up its geopolitical rivalry in the Middle East with Saudi Arabia, which has also ramped up production. The two regional enemies are already fighting proxy wars in Syria and Yemen. "But in order for Iran to recover and become a major player in the Middle East, it has to get oil production back up," said Thomas O'Donnell, senior energy analyst at WikiStrat. In a further show of strength, Iranian oil minister Bijan Namdar Zanganeh recently claimed the country's oil output surpassed 3.8 million barrels per day. 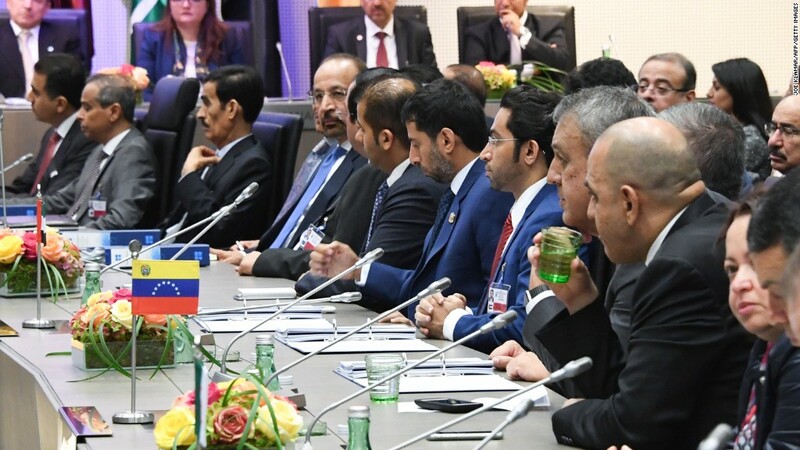 He pointed to production that has nearly tripled in the oilfields in Iran's southwest near the border with Iraq. "They showed their ambition by ramping up on their own faster than people expected. But that just means they're going to reach their plateau more quickly," O'Donnell said. In other words, Iran needs Western energy companies to step in and provide the deep experience and technology required to get the most out of the country's aging oilfields and infrastructure. Related: Mystery: How much more oil can the Saudis really pump? In order to reach their 2021 goal of 4.8 million barrels of daily production, Iran is hoping to attract at least $70 billion of investment under its new Iran Petroleum Contract. However, the IEA thinks the best-case scenario for Iran is 4.1 million barrels -- and that's assuming sanctions don't return and the country gains a "significant influx" of foreign cash and technology. O'Donnell's said there are already signs that Western energy companies are getting frustrated that Iran has been slow to spell out contract details. The feet dragging suggests an "internal conflict" in Iran caused by the fact that contracts with U.S. companies like Halliburton and Schlumberger would threaten the oilfield service jobs currently being done by members of the Iranian Revolutionary Guard, O'Donnell said. "The key will be whether the terms that allow companies to invest in Iran will be attractive enough. We just don't know yet," said Walker.